After a big wait and pushed release dates, we finally get the game we pre-ordered six months ago, yet American players got to play on their region locked version last August. Persona 4‘s JRPG heritage makes it more anticipated than the likes of Injustice, another fighting game that’s loaded with detail and a whole lot of talking. Arc System Works has demonstrated its system on previous games like Fist of the North Star and Capcom‘s Sengoku Basara series. It offers high level graphics, with a fighting system that feels easier to pick up then, for example, Blazeblue‘s. It also does an outstanding job of adapting the original turn-based cast into real-time fighters. 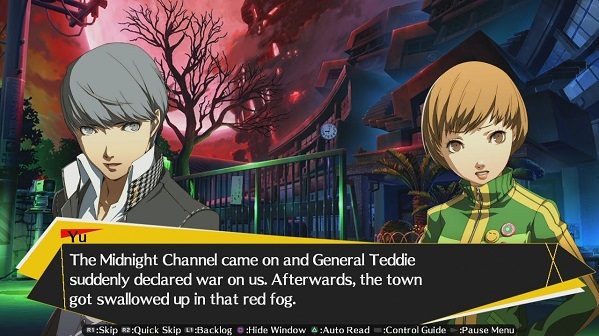 The game takes place two months after the events of Persona 4 and sees the Investigation Team reforming after the Midnight Channel becomes active once again. 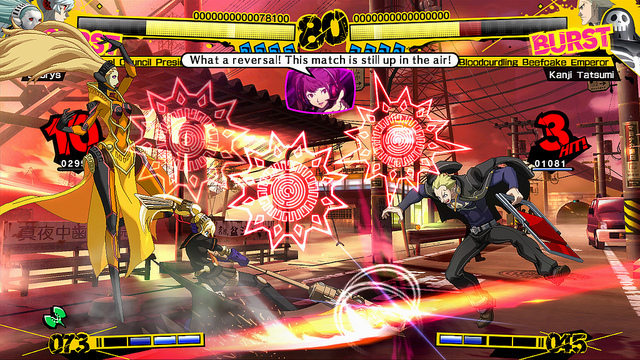 The Persona users pass through the television screen and are forced to fight in a tournament that’s being run by Teddie. You can access all 13 characters in Arcade mode, but only have four to begin within story mode. Story mode is more for RPGaholics, I am such a person, but all the script with added actions felt like reading a book and it was half an hour before I actually got to fight – irritating players who just want to get down to business. If you are an RPG enthusiast it’s worth trying the Lesson mode which is a glorified name for tutorial where you are taught basics from how to walk, to how to summon your Persona, and rather than the inelegant Beginner Mode control system from BlazBlue: Continuum Shift, every player has access to a basic combo that dials out whenever you tap the attack button repeatedly. You enter an Awakening state that unlocks your most potent super moves when your HP falls to 35%. What’s interesting is that you have to mash the attack buttons – in a similar style to some Marvel 3 supers – to get as many hits as possible before launching your opponent. Challenge mode offers a total of 390 combo trials, so you won’t get bored of this game too quickly. Playing online is a must, though most European players have moved on from their early release. You can also customise the eight-player lobbies to attract a certain fighter, or to bar players with slow connections. Another fun bonus feature lets you build a three-word title out of a huge list of over 3000 words. The only fault in this game is the longwinded narrative in story mode, it isn’t integral to know Princess Yukiko has dropped carrots on the floor and is bending to pick them up, not to mention all the shameless plugging of Atlus and Arc System littered all over the place. The graphics of the backgrounds and hand drawn anime cut scenes are great to watch and the music adds a contemporary feel to the game. The American voice actors do a great job, which is quite rare, so it’s all the finer details that make the game complete for the beat’em up player. For more news on anime, cosplay, games and Japanese culture follow me on Twitter and Facebook.